There’s been much speculation that Nokia is preparing a new camera-centric device — known as EOS — to take the baton from its 808 PureView, its final Symbian-based handset. 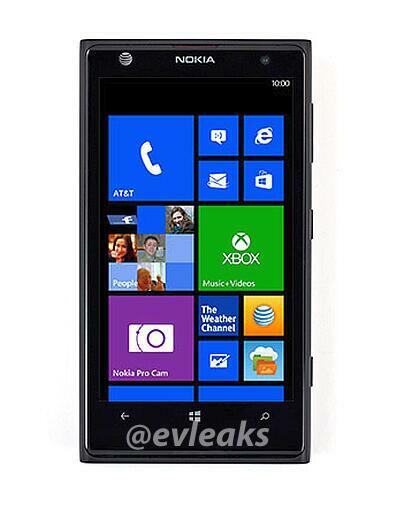 Now serial leaker @evleaks has provided what could be a first look at the device front-on; he says it is called the Nokia Lumia 1020 and this particular one is due out with AT&T this year. The device bears more than a passing resemblance to the Lumia 920 in terms of design but, most importantly, it appears to include new camera software with the ‘Nokia Pro Camera’ tile. The upcoming device has been tipped to sport a whopping 41-megapixel camera and — while this leaked image doesn’t provide hardware details — it certainly suggests that Nokia has plans to bolster the device’s camera software as well as its specs and technology. The Finnish phone-maker launched its new Smart Camera software in May when it unveiled the Lumia 925; the new photo-taking feature is due on other Lumia devices via the Amber update that will drop this summer. Smart Camera enables bursts of 10 photos to help choose the best shot, while snaps come in at a space-saving 5-megapixels. Nokia’s high-end camera devices face a little more rivalry this year, after Samsung launched a Galaxy S4 variant with a 16-megapixel camera and 10x zoom — though with a speculated 41-megapixel camera, the EOS could blow the competition away as the top dedicated photo-taking smartphone.